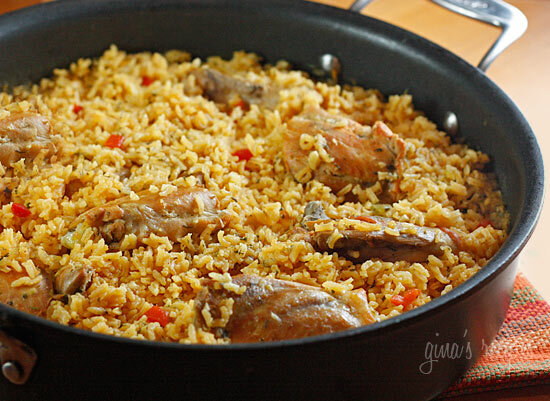 Arroz con pollo, or chicken and rice is the ultimate one dish meal for my family. So many people ask me about my favorite dishes I make at home for my family, well this is certainly one of them! We like to serve this with hot sauce or Colombian aji picante and a simple green salad on the side. I’ve also made a Cauliflower “Rice” and Chicken version. More Latin style rice and beans recipes I love are Slow Cooker Pork and Gandules (Pigion Peas) Stew, Cuban style Arroz Congri (Black Beans), and Arroz con Gandules (Rice with Pigeon Peas). I make many versions of this dish depending on my mood or what’s in my refrigerator, in fact you may have tried my Mom’s recipe, if so, I know you’re going to love my version! For some variations, you can add olives, use a few threads of saffron instead of the sazon, or use boneless chicken breast. So there you have it, go get some hot sauce and dig in! , adobo and garlic powder and let it sit 10 minutes. Heat a large deep heavy skillet on medium, add 2 tsp oil when hot. Add chicken and brown 5 minutes on each side. Remove and set aside. Place onion, cilantro, garlic, scallions and pepper in mini food processor. Add remaining teaspoon of olive oil to the skillet and sauté onion mixture on medium-low until soft, about 3 minutes. Add tomato, cook another minute. Add rice, mix well and cook another minute. Add water, bouillon (be sure it dissolves well) and remaining sazon, scraping up any browned bits from the bottom of the pot. Taste for salt, should taste salty enough to suit your taste, add more as needed. Hi! Can you convert this to an IP recipe? 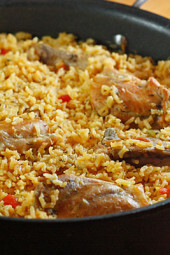 I LOOOOVEEE arroz con pollo and would like to try it in my IP. Thanks!! Love love love this recipe – I was wondering if you would ever do an instant pot version? Its been tricky for me to get the timing right, the rice usually is either too soft or too crunchy, and an easy instant pot version would be amazing! yes I did it for my new book coming October! Made this tonight and the chicken thighs needs longer than what’s recommended. I put mine in the oven on 425 for another 20 min after the rice cooked. Also, some of my rice was still hard. The seasonings are nice. Gina, could this be made in the instant pot? After dinner my sister says, “this is my favorite Gina recipe so far”. Turned out so pretty and delicious. Followed the recipe to a T. My rice has never been so fluffy. Not one crunchy piece! Sooooooo good. Hi Gina. I love all your recipes! I’m going to try this one this week. I wasn’t sure which Sazon to buy. I got the one without annato and the regular one with saffron. Which one is better for this recipe?? I would like to try making the arroz con pollo in the instant po. Have you ever done it like that? No but I think I will try! Can this be made in the Intstant pot using the rice setting? If so, what adjustments do I need to make in the ingredients? I always end up with some “crunchy” rice when I make this on the stove. I am making this tonight and I just had a couple questions. is it 1/2 tsp of garlic powder? Also, the 2tbs of bell pepper.. is that dried or fresh? Yes 1/2 tsp and fresh bell pepper. I’ve made this twice and both times the flavor was outstanding but I seem to be doing something wrong with the rice (it was crunchy). Do you think this would work in the crock pot? If so, what changes would I make? Would love the recipe for the rice featured with the steak flacos!! What type of vinegar do I use? White? Balsamic? This looks so good! I'm making this right now and my house smells like Abuelita's did when I was a young girl. I hope the new-recipe gods are working in my favor and it comes out as delicious as it smells! Gina, I have been using your website EXCLUSIVELY since April and I have lost 35 pounds!! Your site has been a game changer for me (and my Puerto Rican boyfriend hehe) Thank you so much! PS. I am making your Arroz con pollo for the second time tonight, yum!! Thank you, that is awesome! Keep up the great work! Tried this this evening and the whole family was pleased. This is going into the family meal binder. Easy and delicious! What would be the equivalent for homemade sofrito (garlic,onion,pepper,tomato and cilantro)? My mother called me this morning from Spain and asked me, what are you cooking today? I said: I don't know but it is going to be a Gina's recipe. Wow I just tasted the arroz con pollo and it is so sabroso. Thank you so much for your wonderful recipes. I absolutely love your arroz con pollo. I am very excited to try this tomorrow! Question for the cooking impaired…do I put the rice uncooked in the skillet, or do I cook it first and then add it in? The rice is uncooked when you add it in. Absolutely my favorite recipe of yours, delicious!! This is so delicious! It is definitely a 5 star recipe. I've made this about four times now.. including one time for a dinner part, and everyone loved it! If you are craving Mexican/Hispanic flavors and don't want to feel guilty afterward.. this recipe is perfect. This is such a delicious dish…I however did not take the skin off cause I'm a fatty! Lol very yummy! This was a great recipe! I've been using your recipes since college and they never disappoint. Thanks for reminding people that you can still stay on track and eat delicious food! All I can say is yummy, it hit the spot at dinner time. 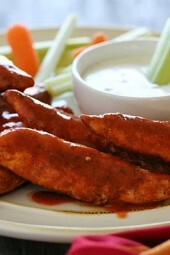 Awesome recipe and super flavorful!! Could this be done with brown rice instead? Yup. Just replace the chicken bouillon with a cup of chicken stock. The extra water allows the brown rice to cook. Works every time. I made this Arroz Con Pollo recipe for my boyfriend today. He said it was definitely a keeper! We are in Mass., and fiddleheads are in season. I blanched, then sautéed them in light butter and garlic, then seasoned with lemon zest, lemon juice and a sprinkle of Manchego cheese. Is there a way to make this without tomatoes? I can't handle the acidity of tomatoes. Is there a substitute? the flavors in this are excellent! I went to college in Miami,FL and have been craving this for some time as I now live in Ohio. The only difficulty I had was chewy rice…followed your instructions and did my best even to not peak! Any suggestions for what I might have done wrong? I made this last night for dinner with 2 cups of brown rice instead of white rice. I also added a cup of chicken stock since didn't have chicken bullion and I needed more water for the rice. And since my fiance hates onions and peppers, I used Sofrito. My fiance just texted me that we need to make this a household staple which means it was really good. Thanks for the guidance Gina. I love your recipes and I can't wait for the cookbook. you make weight watcher flavorful!. This was incredible!! YUMMY! Definitely a keeper. I think next time I will cut the rice in half. I'm guessing I could just cut the water by half as well and be OK? Thoughts? Hello there! I recently snipped your Cilantro Lime Cauliflower Rice recipe but have been a little hesitant to try it. THEN last night tried Paleo Paella (made with cauliflower rice) at a great restaurant last night. Do you think this recipe could be tweaked to use the cauliflower instead of rice??? I'd love tips or thoughts! Loved it so much, yummo! Thanks Gina, this recipe was awesome. To quote my picky eater son, the dinner was a "dream" and my husband said it was the best chicken dish he'd ever had. All my 3 kids had seconds. The chicken was so tender, I could cut it with a spoon! Hubby and I loved the aji picante, he thought it was the perfect hot sauce. As always this was absolutely delicious! Thank you for all of your wonderful recipes. I have "WOWED" my husband over and over. Thanks!! HI! I love this site 😀 is so great to see healthy recipes like this one, i'm from Venezuela and arroz con pollo is classic! I'm so happy to see it lightened up to stay healthy! THANK YOU Gina! My family loved this dish- very flavorful and delicious! Will def make again- thanks! Can I use Sofrito as a substitute for the oinion, garlic, cilantro…and if so how much would you suggest for this meal? How do I adjust the recipe if you use brown rice? @Lauren Sully – The chicken will cook thoroughly through when added back to the pan. And the rice is NOT cooked ahead of time. I wondered the same thing the first time I cooked it. Just follow the directions as Gina says. As far as the rice, I just used regular old rice. I think Mahatma brand says "enriched long grain" right on the package. HTH! I made this tonight (second time making it). The flavor is unbelievable. I am glad to be introduced to those Goya type seasonings b/c they make a huge difference in the flavor. Gina: When you say "brown the chicken" does this mean the chicken is being cooked all the way through? Or does the chicken finish cooking while boiling in the rice? ALSO, is the rice cooked before you put it in the pot? or is it raw/hard? Not sure what "enriched long grain" means. NEW COOK here. 😉 Thanks, GINA. Amazing! 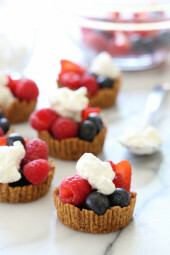 This is by far my favorite of the recipes I've tried on here and I've loved them all! Thanks for the comfort food, Gina! Saw this recipe recently and I swear you used a can of light beer in it? Was I imagining this or is that your mom's recipe? If it is, can you please help me find the link to her recipe? thanks! Hi amy villanueva, I'm from mass also. The south shore. I loved this recipe. Very delicious. I just made this & I can't believe how yummy it is. My ex husband is Puerto Rican & my kids only get this kind of food when they go to his house & I only get it when I go to the Spanish restaurant! My oldest just had a bowl & said it was pretty delicious! I was pretty blown away with how good it came out as well. All the other times I've attempted to make yellow rice have been a complete flop, even with my ex giving me a play by play over the phone!!! Even my parents liked it & they're not really into Spanish food/rice dishes. I can't wait to make this again! Just a side note for those looking for the Badia seasonings…I'm in Mass. and most grocery stores here have a hispanic foods section with Goya etc but the Badia seasonings are usually in their own little spot within the store, usually an end cap/separate shelf & not always near the hispanic aisle, sometimes by the baking/seasoning aisle. Just made this for dinner and it is so ridiculously good! My 8 year old had two bowls. I can't wait to have the leftovers tomorrow for lunch. Thanks Gina! Gina, I can not thank you enough.. I was so happy to find your site. I recently joined WW. Losing weight has always been very difficult for me..I have some health issues so losing weight is no longer about fitting into a new outfit.. I have been on many diets..boiled or baked chicken with steamed broccoli and a small side salad. I thought I would have to eat this for the rest of my life. I have now discovered it is not about a diet, it is about life changes..and you have provided me with so many different types of recipes and meals for myself and my family. I am from south texas and growing up we had arroz con pollo once a week..How happy am I that I can still have arroz con pollo..Thank you for taking the time to share all your recipes..
Hi Gina! I discovered your site off of myfitnesspal. Although I am not on WW I love your low fat low calorie recipes. This is by far my favorite so far. It has become a weekly staple for my family and me. Thank you so much for sharing your wonderful recipes with us! Thank you Gina for this recipe. This tasted just like my Puerto Rican grandmother made while she was living. This recipe helped me to expose my daughters to part of their heritage.Tonight I am making the Shaking Beef so I am excited to see how that turns out. Did you remember the seasoning, the Sazon? I think there is saffron in there to turn it yellow. I'd let it cook more until the rice is done. Hmmm. mine is not yellow and the rice did not cook. bummer!! Could you please recommend a brand/style of cooking skillets/pots that would work well for cooking a lot of your latin recipes? Love your Blog! Thank you! OMG!!! Let me start by saying that my husband and I are both Italian, and I have rarely ventured far from that cuisine (as far as cooking is concerned), so chicken and rice has never been in my repertoire. We didn't know what we were missing, or should I say, I didn't know I could cook it and it would actually taste sooo good!! It was amazing!! Worth the prep, thats for sure!! It made a ton of food. We had enough for our family of 4 for dinner, and my husband made 2 nice size lunches with the leftovers. Thank you Gina for helping me to expand my horizon in a healthy way! Was delicious! Makes a ton – make sure you start off with a very large skillet or a 5 quart saucepan! I didn't understand the garlic measurement either. I used 1/2 teaspoon and I am making the dish right now! I hope it turns out as good as everyone says! Smells great! This sounds delicious! One question. The recipe says about 1/2 garlic powder. Is that about 1/2 teaspoon garlic powder? Thanks. 1/2 what, though? Tablespoon? Teaspoon? Made this for dinner tonight. Only thing I couldn't find was the Adobo Powder, so I just used some cumin, oregano, and season salt as a substitute. The Goya Sazon was found in my local Walmart in the mexican food aisle. It has 6 packets inside. I used a full 2 packets – one for the chicken marinade and 1 at the end of the recipe. 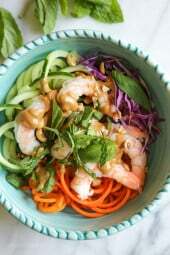 We loved this (saw it on Pinterest first) – my only addition next time would be to add some spicy heat, so I'd probably add a serrano or jalapeno to the food processor with the cilantro, garlic, bell pepper, & onion. And maybe some chopped up fresh mushrooms. Using the boneless, skinless (previously frozen & defrosted) thighs was a good choice – I think the chicken breast or tenders would get too dry. Love that this is a one-pot meal. And leftovers are totally yummy too. Thanks so much! I made this for dinner tonight. The flavor was great. I made the adobo seasoning and goya off of recipes I found on-line since my local grocer didn't carry either. The actual recipe was a long and time consuming process that I found really tough to do with 6 month old baby. My hubby is filipino so we eat rice a lot and I've never had trouble cooking it. My rice following this recipe just didn't come out right. It was a lil crunchy 🙁 If the hubby was home and/or I had a helping hand with the kids I'd give this another go. This was AWESOME! I made this last night and it turned out Great! My Husband ,who's Puerto Rican was Sceptic at first but really ENjoyed it and said it was better then out favorite Cuban restraunt in town! 🙂 SO 3 thumbs up! Thanks again for a GREAT recipe! ps. I used bonless, skinless chicken thighs! What kind of vinegar do you use? White or apple cider or what? KEEPER!!!! The flavor is wonderful!! Took a bit of time on the prep end but next time I'll know the recipe a bit better & plan accordingly. Thanks so much!!!! Gina – I made this tonight and my husband and boys at it up! I did dice the veggies instead of putting it in food processor and used skinless, boneless thighs. I also used a whole packet of Goya Sazon for marinating the chicken. I left out the scallions, the green bell pepper and cilantro were pushing it my kids as it was. I did omit the salt on accident so we did have to salt it when done but it was a GREAT meal. This is going into the rotation! Hi Gina, I love chicken and rice. Only thing I would love to add in addition to this dish are some red beans.